Owls are some of the most beloved raptors, and their silent flight, large eyes, mournful calls, and nocturnal behavior makes them both magical and mysterious. Because owls are not highly active during the day, a backyard owl can coexist with other backyard birds, and as excellent hunters, they can help control squirrel and rodent populations. Smaller owls may also help control large insects, and owls will occasionally catch reptiles such as snakes and lizards as well. Because they do not eat birdseed, these birds are also inexpensive to attract compared to birds with hearty appetites for costly seed or other foods. As with attracting any birds, the key to attracting owls is to provide their four basic needs: food, water, shelter, and nesting sites. Food: Owls will not visit bird feeders, but it is possible to provide a steady food source for these hunters. Because owls eat mice, voles, gophers and similar small rodents, backyard birders who have mice nearby are more likely to attract owls. Leaving grass uncut, adding a brush pile and leaving seed on the ground will make the yard more mouse-friendly, which in turn makes the habitat more owl-friendly. Avoid using poisons or traps to eliminate mice or other prey, and let owls take care of the problem instead. Water: Owls get the vast majority of the fluid they need in their diets from the prey they consume, and they are not frequent visitors to bird baths. In hotter climates and during the summer, however, owls may visit slightly larger, deeper birdbaths to drink or bathe. Providing this type of water source in a quiet, secluded area is more likely to encourage owls to visit. Shelter: Owls need somewhat dense, mature trees with good trunks to roost during the day, preferably in a shaded, secluded area. Both coniferous and deciduous trees are suitable if they are a good size. Empty owl nest boxes are also good alternatives to natural shelter, but providing natural spaces where the owls can feel safe during the day is the best way to encourage them to roost nearby. 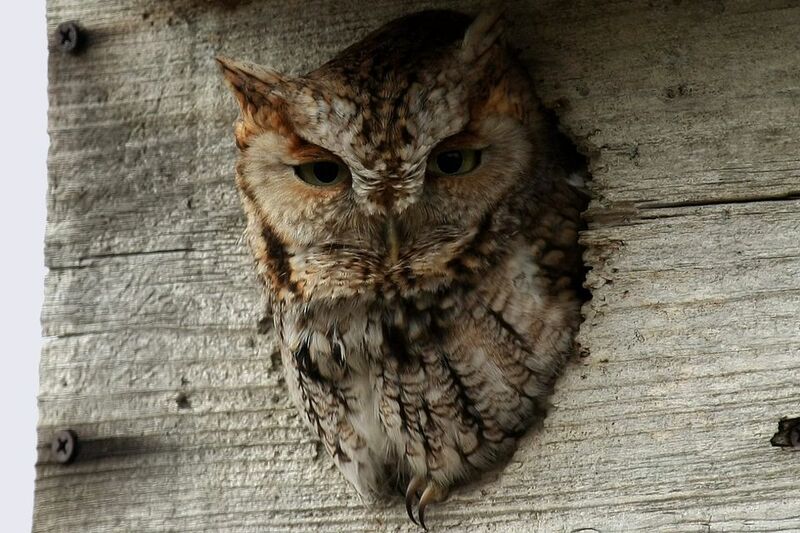 Nesting Sites: Hollow trees are most owls' preferred nesting sites. Smaller owl species that are more likely to be common in the backyard may also use large nest boxes that are positioned 10 to 20 feet above the ground on a large tree. Barn owls may also use abandoned buildings for nesting, and leave a barn or shed open for the birds to access can give them a great place to raise a brood. Nest boxes should be put up by January or February for owls since these birds nest much earlier than other backyard species. The boxes should be monitored to be kept free from wasps, squirrels, rodents, raccoons or other birds or guests that may discourage nesting owls. Leave large, bare branches and dead trees intact as much as possible to provide perches and roosting spots for hunting owls. Create a rustic, natural section of backyard habitat with little pruning or maintenance where owls can feel more comfortable, especially for nesting or roosting. Avoid extensive exterior lighting such as illuminated water features, floodlights or spotlights, even with motion sensors. Owls hunt more effectively in darkness and will not visit well-lit yards. Keep pets indoors after twilight and during nighttime hours. This will keep the pets safe from hunting owls and keep pets from scaring away the mice and other rodents that the owls will hunt. Take steps to prevent bird window collisions on large windows that might be a danger to hunting owls. Do not release cage mice or other small pets with the intention of providing supplemental food for owls, and do not buy dead mice or offer other meat to tempt owls. These types of pets will not survive outdoors, and owls must hunt live prey to meet their nutritional and behavioral needs. Avoid frequent use of recorded owl calls that can agitate the birds and distract them from the hunting or nesting activities they need to survive. Too many calls may also simulate excess predators in the area, which can deter other birds from visiting. Remove all types of netting from your yard at night, including soccer or hockey nets and the netting from basketball hoops. Flying owls can get tangled in these nets, causing distress, injuries and even death. Seasonal decorations, such as outdoor decorative cobwebs, are another threat that should be removed to protect owls.